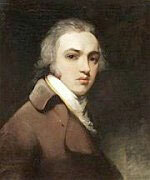 Sir Thomas Lawrence (April 13, 1769 - January 7, 1830), was a notable English painter, mostly of portraits. He was born in Bristol. His father was an innkeeper, first at Bristol and afterwards at Devizes, and at the age of six Lawrence was already being shown off to the guests of the Bear as an infant prodigy who could sketch their likenesses and declaim speeches from Milton. In 1779 the elder Lawrence had to leave Devizes, having failed in business and Thomas's precocious talent began to be the main source of the family's income; he had gained a reputation along the Bath road. His debut as a crayon portrait painter was made at Oxford, where he was well patronized, and in 1782 the family settled in Bath, where the young artist soon found himself fully employed in taking crayon likenesses of fashionable people at a guinea or a guinea and a half a head. In 1784 he gained the prize and silver-gilt palette of the Society of Arts for a crayon drawing after Raphael's "Transfiguration," and presently beginning to paint in oil.